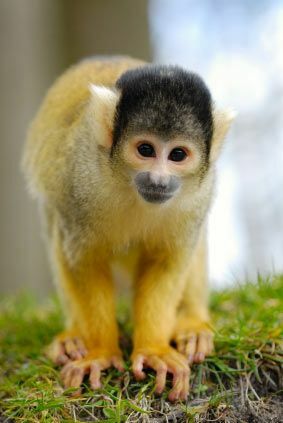 NASA plans to subject squirrel monkeys to gamma-ray radiation to learn how long space trips might affect humans. The People for the Ethical Treatment of Animals has obtained documents discussing a controversial NASA-funded projectthat would expose squirrel monkeys to radiation. PETA obtained the documents, which include a draft "Decisionregarding the disposition of the NSRL Proposal N-249," through a Freedomof Information Act request; however, the documents do not resolve the future ofthe spaceradiation experiment, which would take place at Brookhaven NationalLaboratory. Citing an exemption under the federal law, the U.S.Department of Energy redacted essentially all of the content of the emails andthe draft decision it forwarded to PETA. A statement on PETA's website read: "Unfortunately,before the government sent us these documents, it blacked out Brookhaven'sdecision, so we don't know if plans to hurt these animals are moving forward ornot." A decision is pending, a spokesman for Brookhaven NationalLaboratory told SPACE.com. The time frame was not available. The proposed project would expose27 squirrel monkeys to high-energy gamma-ray radiation, then researcherswould observe its effects on the monkeys? health and task performance. The objective would be to help NASA predict theneurobehavioral effects of space radiation ? the most poorly understood healthrisks for astronauts, NASA officials have said. In November 2009, when plans for the study were firstannounced, NASA officials told SPACE.com that ?research that simulated theeffects of space radiation showed that it affectednerve cells in cultures, and could affect behavior in mice and rats. Butthose studies were limited by the amount of extrapolation required for humanbehavior and performance. "Studies in nonhuman primates are essential to be ableto best predict neurobehavioral effects of radiation on humans," NASAspokesperson Bill Jeffs of the Johnson Space Center in Houston said at thetime. The study would reportedly expose the monkeys to radiationsimilar to what astronauts would experience on a three-year voyage. Over the past year, animal rights advocates have protested theplans. As part of a letter-writing campaign to thwart theexperiment, PETA describes it as not only cruel but also attacks the design ofthe experiment, saying the differences between the monkeys and humans will makeit impossible to generate usable data, and that the single large dose ofradiation will not simulate astronauts' extended exposure. ? NASA isn't the only space agency looking to use monkeys toadvance spaceflight by exposing them to radiation. And PETA is not the onlyanimal rights group filing protests. ?The advocacy group Animal Defenders International israllying against a Russian Federal Space Agency (Roscosmos) projectcalled Mars500. Like the proposed NASA project, this study uses monkeys asproxies for humans exposed to radiation during extended space travel, ADIofficials said. ADI officials say the Russian tests severely restrain themonkeys and cause horrific side effects. Officials from the European Space Agency have reportedly saidthey view using monkeys to simulate space travel as unnecessary, ADI officialsadded. Wynne Parry is a Senior Writer for LiveScience, a sister publication toSPACE.com.